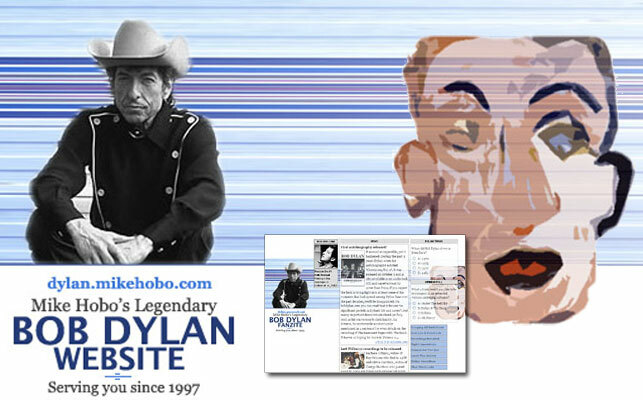 Five years after it went online as a stand-alone Bob Dylan website, and seven years after its initial golive as a part of the "100% Pure Cult Website", "Mike Hobo's Legendary Bob Dylan Website" (formerly known as the "100% Pure Cult Bob Dylan Tribute Website") has been completely redesigned and relaunched. The first thing you'll notice apart from the obviously completely new design, which makes it one of the web's attractive fanmade Bob Dylan websites, is a couple of new features and content sections. Take a look at the extensive Dylan album and song database under "Recordings Revisited", providing detailed information on all officially released albums and album tracks. Songs are marked as Mike Hobo's hot picks, singles, and B-sides. Both songs and albums can now be browsed through by category or item by item. The new Blog-style news items and additional website features can now be found directly on the homepage. The biography section is now split into decades, the musicians page and the gallery have been updated. The forum is now moderated, keeping non-Dylan-related or nonsene postings from being published. Submitted sites for the links section will now be approved manually to prevent spam and non Dylan-related content. The very popular trivia and opinion poll as well as the unique "Bob era cam" are classics and couldn't really be improved, well they actually do look a little better now and work a little smoother. And last but not least there are two all new sections, "Obviously Five Producers" and "Little White Wonders: Bootlegs". Thank your for your continuous support that makes it one of the web's longest-running non-profit Bob Dylan fan sites. UPDATE: With another new redesign the following features have been cancelled: Bob era cam, Trivia/Opinion poll, and forum.